Princess Merida is a very brave, bold, daring, courageous, stubborn, rebellious and headstrong girl who does not fit the stereotypical princess role. She is very athletic and enjoys nothing more than riding her horse Angus and practicing her archery, of which she is the best in the kingdom. Princess Merida is the headstrong and free-spirited 16-year old tomboyish, willful daughter of Queen Elinor who rules the kingdom alongside her husband, King Fergus. 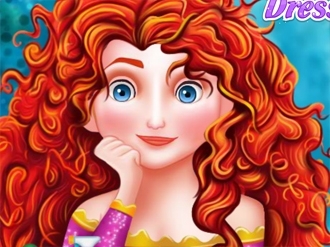 Merida is an impetuous girl who wants to take control of her own destiny. Merida has honed her skill in archery, and is one of the most skilled archers ever seen. She is also skilled in sword-fighting and racing across the countryside on her horse, Angus. 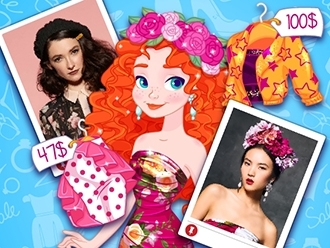 All these have negative effects on the skin, the young Merida. Besides Merida is a warrior must be beautiful, so go to the beautician castle for a facial treatment. Have fun in this doctor game!